Mary had the camera at the fair so she could take photos there. I didn't have it during the first reception. She picked me up in Trail around 7pm, we buzzed by home, picked up Jeremy. Changed a couple of shirts that were full of cotton candy or other signs of the fair. And we went to Goodridge. I married Travis and Kallie last October, but for various reasons (job, education, family, etc) they waited with their reception until today. This also was a nice gathering, though Goodridge had more mosquitoes than did Trail. Some of you may remember David, his neck was broken by a hay bail a year ago in January. Kallie is his sister. David has been going through a lot of different exercises and therapy. Their Mom keeps up the news about David at their Caringbridge site. And what's a wedding reception without a dance? And what's a photojournal without some kind of National Geographic bad photos. Yeah, you know the kind of photos, the over exposed shots when it's dark out. People all blurry, lights flamingly bright. So here's my National Geographic style shot of the empty dance floor. The columns of light are really just small white Christmas light strings, as you can see in the photo below. We didn't stay very long. We left about 9:40. Of course, rounding up the 8 kids took a little time. We couldn't find Matthew. So we searched throughout Goodridge. That's not a big deal, it's only 5 blocks wide and 8 blocks long or so. He was with some of the other kids at the school playground. But he didn't ask for permission. Grounded! 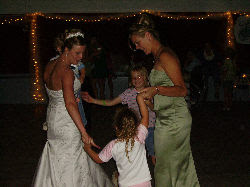 Here's Kallie, the bride, Courtney (her cousin), the Maid of Honor, Clara and a couple of other girls circle dancing. The little ones still don't have the discretion of knowing when to quit, so Kallie went and hid in the kitchen for a couple of songs until the little ones gave up. Well, we got home about 10pm. I opened my door (Mary drove) and I heard psssssssssssssssssssssssssssssssssss. Drat! The left front tire went flat. My car is in the shop, the van is our only vehicle now. I've got church in the morning. With daylight still shining I know that I have about 1/2 an hour to change the tire. (Yes, for you more southerly latitudes, it still is bright at 10pm this time of year) I run to get the jack and the lifts. I can't find the jack handle. Double Drat!! Somebody must have used it as a light saber and not put it away. I find the recking bar to use it as the handle instead. The jack's too short! Triple Drat!!! I have to get a concrete block to support it. I run to check for the tire. Dad, I'm sorry. I realize in my desperation that I didn't get one. Quadruple Drat!!!! After 10pm I call Brad and Lana. We know they're still up because they were babysitting their grandkids. The grandkids' parents were at the reception and we had left before them. They graciously lend us a car, drive it over. I take Brad home, go and memorize my sermon. Something smells like cat urine. It's my hands! The cats must have gone on the jack during the winter. Quintuple Drat!!!! Soap, Alcohol, Lanolin (brand name Gunk) and at least it's not annoying anymore. In bed by 1am. Need to get up at 6 to get to church on time in the morning. We had worship at Mt. Olive this morning, with Saturday School and Confirmation class. Got home about 11:30. I went over to get some things ready for the wedding. The entourage had started to arrive and were primping and preparing themselves. Gotta get the right nail gloss on the flower girls. Then, make sure they don't mess it up while it is drying. The entourage trickled in between 11:30 to 1:30. At that time the photographer came, so they were all supposed to be ready. I got a few cameo photographs for Shawn and Becky during this time. No one else was taking pictures. I thought they might like them. And I got a shot or two of the photographer taking some pictures. Mary had to leave with the kids for the fair at 2pm. She took the camera with her, so I have no photos of this wedding or the reception. But that's ok. I was only taking pics for them if they wanted to use them. The wedding was at 3:30. Quite a packed house. The wedding went well. I had to stop for a moment after the Scripture readings. The groomsmen, who were all very good at keeping their knees bent and moving around a little during rehearsal, all of a sudden became tin soldiers. Let me put it this way. The groomsmen were all wearing rather warm tuxedos. While the temperature in the main part of the church was ok for people who were sitting, it became stifling hot up front. When I looked up after the Scripture lessons I noticed how ramrod straight they were standing and that they had red and white blotches from the heat. I said, "Ok, we have to pause a moment here folks." To the groomsmen, "Guys, I appreciate how quietly you're standing, but that pew a few feet from you is right where your head will hit if you pass out. Bend your knees, move around a bit, it's ok." They relaxed after that and did well. Shawn and Becky's fathers are deceased. They had two candles in memory of them. For their Unity candle they lit their own candles from their "father" candles and then lit the unity candle, snuffing out their own individual candles. It is a symbolic ritual that is quite popular in American culture. Some churches prohibit the ceremony and claim that it comes from ancient pagan sources. Fooey. The first documented Unity Candle was by Allan and Kathy Chattaway of British Columbia in 1969. But people began to like the ceremony when they saw Luke and Laura use it on General Hospital in 1981. It's not an ancient pagan ritual, it's a modern invention popularized by a Soap Opera. I suppose some might think this makes it even less worthy of emulation. Nevertheless, the ceremony does no harm and may be used very well to show symbolically the statement of Genesis 2:24 "Therefore a man shall leave his father and mother and be joined to his wife, and they shall become one flesh." It can also serve as a reminder of Christ's words in Mt. 19:6 "So then, they are no longer two, but one flesh. Therefore what God has joined together, let not man separate." It is easy to snuff out a candle. It is easy to snuff out a marriage. Marriage requires the persistent attention of not only the Bride and Groom, but that they be united in nourishing their marriage against all those who would snuff it out. Let's see the liturgical Nazi's come out of the woodwork on this one. My rendition of Bach went ok, except that they went so quickly through the lighting of the Unity Candle and greeting their mothers that I was only about 2/3 the way through by the time they were done. Nothing goes quite as it's practiced. So I wrapped it up and concluded the service. Remember, Mary has the van, and my car is in the shop? How do I get to the reception? I hitched a ride with the mother of the bride. 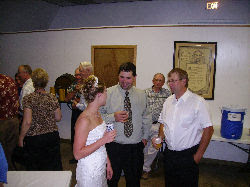 The wedding reception was in Trail, Minnesota (pop. 63) where my congregation of Mt. Olive is located. Yes, that's where I had worship this morning. It was a lovely evening, cooling in the air and just enough breeze to keep the mosquitoes away. Friday evening was one of the few evenings so far this summer that the bikers could take their hogs out in nice weather (that is, if thick mosquitoes are not considered). 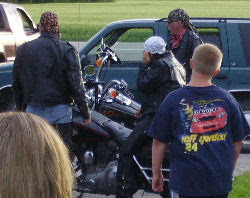 So, for wedding rehearsal that evening, some of the members of Shawn and Becky's entourage came on bike. After cleaning their teeth, everyone was ready for the practice. The practice helps the members of the entourage know what to expect when, how to move so that there are no accidents, and the timing of everything. The rehearsal went quick and smoothly. It'll be Shawn and Becky's big day on Saturday. I'm kind of nervous. It's not my first time solemnizing a marriage. It's only the second time that I've played guitar for a wedding. Yes, I performed the ceremony, but I was also asked to play the Prelude to Bach's Cello Suite No. 1 (BWV 1007) during the lighting of the Unity Candle. The last time I played for a wedding was for Kristy and John, in 1989. That was Pachelbel's Canon in D. I've played occasionally for church services (Christmas and an occasional Psalm selection), but nothing this complex (for me) in a long time. Mary went down to Luther Island Camp this morning to get the kids. I stayed home with Elsie and the younger ones. I had them do chores during the morning. Then, just before giving them a movie as a reward for a good job done, I took them out to water all the plants and harvest strawberries. 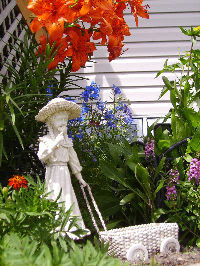 This first photo is of Mary's flower bed beside the deck. I don't know which flower is which--except that there are some orange, some blue, some violet, and some reddish flowers here. I planted tomatoes and Thai hot chillis next to Mary's tomatoes. Yes, these are also mosquito hatcheries. We'll keep some vegetable oil or soap in them if they get water in them. The campers got home around 3:15pm (I think). They all claimed to have had a good time, but they all looked pretty tired and worn out to me. 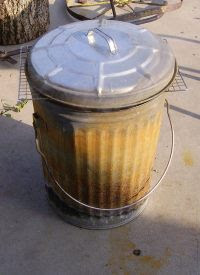 OK, yes, I already showed my inexpensive smoker. I did another batch of peppers. The large ones are medium spicey, cubanello peppers; the smaller ones are hot jalepenos. 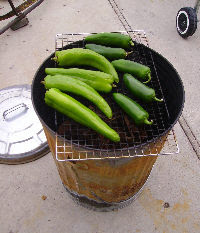 Smoked jalepenos are called chipotles. Here's how they lay out on the rack. It only takes a couple of hours, during which you can do something else. Here's what I used for wood chips. Natural, untreated bark. Cheap and easy to soak in drain-able plastic bag. I might try some fish on the smoker if I can catch any. Here's the finished product. Now, just mash 4 peppers into 2 chunks of cream cheese, and MMMMMMM. 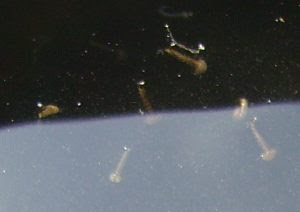 The young mosquito larva can be found in great abundance even in the shallowest of puddles inside of old tires. When we go out at night, it's not quiet. But the frogs, the swallows, the dragonflies, and the bats are happy. They've got plenty to eat with all these mosquitoes. 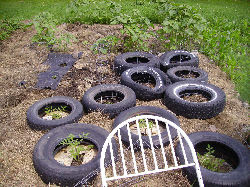 I went around one evening dumping out any tire or bucket or anything that I could find water in. If it was supposed to have water in it (like a bucket for soaking roots for planting) I put a bit of vegetable oil on top of the water. At least then the larvae can't become mature. They bounce up and down in the water, but they have this little snorkel that they have to put up to the surface in order to breathe. A couple drops of oil on the water keeps them from being able to breathe. 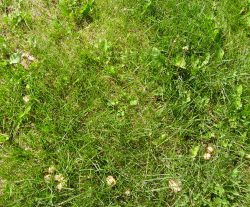 The wet this year has allowed a bunch of mushrooms to sprout in our lawn. Sophie grazed on a button mushroom last week. Yeah, we called the poison control center. They told Mary that she should get another mushroom like the one Sophie ate so that the local physician could look at it if necessary. But it wasn't necessary. Sophie was fine. 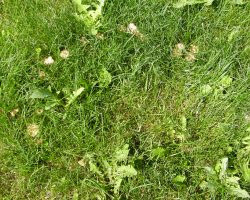 These two photos are of fairy rings. There's a wikipedia article on fairy rings here. We have probably a half a dozen fairy rings this year. Each of the rings is about 2 feet across. It's kind of neat to see these things growing this way. But, if one of the little ones is going to try to eat the mushrooms, then I'd rather not have the fairy rings at all. Some people spend a lot of money on things like fishing, grilling, food smokers, etc. 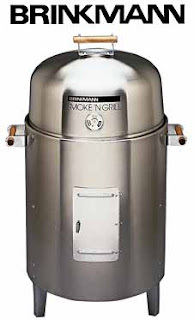 This Brinkmann is available at Cabellas for around $180. At Cabellas the wood chips cost $9 per 10lbs. 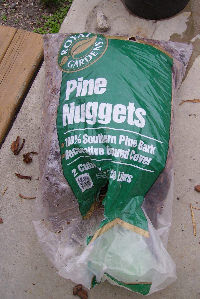 If we don't happen to have wood chips there are a couple of options 1) we could go to one of the city mulch sites and scoop up as much as we want of wood chips, 2) we could just get a cheap bag (40lbs for $5) of natural bark mulch. So, the Cabella's shopper is up to about $200 for smoking some Anaheim peppers or steak, or whatever. We get our wood cheap. But that ain't all we got cheap. Here's my smoker. I put a bit of charcoal in the bottom, put some starter fluid on it, get it going. 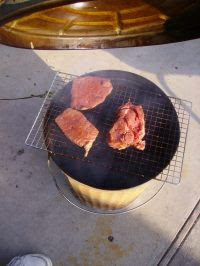 Soak the wood chips, and when the flame goes out drop about 2" of wood chips on top of the charcoal. I use the trash can for a lot of things, but not for trash. It functions as an oven in camp fires as well as a smoker. Last night we smoked a bunch of Anaheim peppers. Here's what you do. Smoke the hot peppers until they are all soft, shriveled, mushy, and dark. Soften 2 bricks of cream cheese and mush the peppers into the cream cheese. Oh man, that stuff is good. Here's the smoker in action. 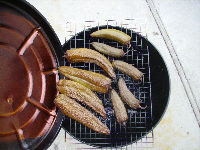 Note the expensive drying rack ($1.50 at Walmart) used in this smoker. After getting the peppers done I put our steaks in the smoker. Wow, what a nice flavor. The kind of wood doesn't make too much difference, unless the wood is particularly aromatic. I used pine bark, that was really nice. And being the do it yourselves kind of people we are, I thought I'd include a photo of my anvil. The chunk of rail cost me $7. Contrast that with $300 or better for a real anvil. 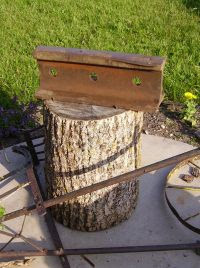 The stump is from Henry and Betty. Thanks. This building is somewhere in NW Minnesota. Arlene! Thank you for the card. I'm so happy that you have let others in on the blog as well. I hope things are going well for you out in the Pacific NW. Are you the reason that I have readership all up and down the Chinese coast? Probably not. Anyway, your sister sent me the letter about how you all donated the memorial money for your folks. I put it in the bulletin this past Sunday. Thank you. 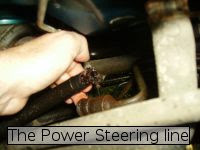 As I was leaving Mike and Amanda's place for Emma's baptism party on Sunday, I thought the steering on my car was a bit stiff. I got to Oklee, pulled in at the Cenex for fuel. Each turn was like the power steering got shut off somehow. Smoke came out. 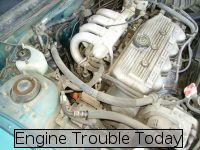 Hot steering fluid dripping on the exhaust pipes under the engine. 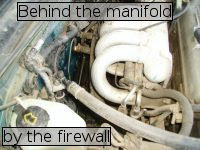 Steering fluid sprayed all over the firewall. I like this car a lot. I've gone as much as 360 miles on 8 gallons of gas in it. So, I want the car to get well, soon. When I got home I diagnosed the problem, and took these pictures. Monday we took the car in to Scott at the Oklee Cenex. He thinks he can crimp or braze the ends of the tubes together. If not, I'll try the junk yards, ordering a new part is a last resort. We're down to 1 vehicle at this point. Hopefully this can be taken care of before the weekend. 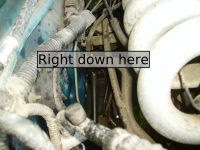 On this line the flexible hose end detached from the little inline flow regulator. The flexible line is long enough to cut and reattach. But I don't have the tools to do that. Now, Tuesday afternoon, Scott isn't done with it. He's going to test it out in the morning, to see if his brazing holds. Monday we were treated to a wonder weather phenomenon. There are two videos in this post. The first is a 35 second view of the wall cloud that came over Oak Park Monday morning, around 10:00am. Incidentally, I looked at the statistics for my Youtube videos. I've only got 7 videos there. The most popular so far is the video of Stella falling asleep with pizza, 321 views! The Clearwater LYS Halloween video is second place with 35 views. I wonder what made Stella's Pizza sleep so popular? The cloud moved pretty fast. We were at the table when I saw the cloud in the distance. I looked for my camera, and the cloud was already on us. No tornadoes here, though Roseau and spots near there got hit with tornadoes. Here's the longer video (about 4 minutes) on Google's video site. OK, comments are on, moderated, of course. But if it gets to be too much to manage I'll turn it off again. Sunday we had worship at St Petri, Oak Park, and Nazareth. Today was a big day for Jeremy, Matthew, and Louisa. Camp Day! It's Louisa's first time at Bible Camp. They're all excited. It was a devoted chaos getting ready so that Mary could drive them down to Luther Island Camp, where the ELS Camp Indianhead is held this year. We weren't able to get Mat a digital camera, he'll just have to make due with the two disposable's Mary bought him. If I can, I may scan a few in if they want to tell their camp stories. 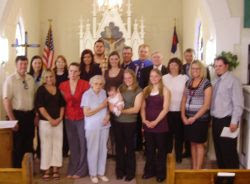 Mid afternoon was Emma Amanda Mae N.'s baptism. 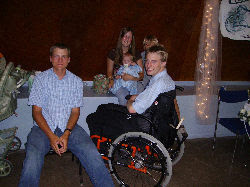 The photo has Emmas' parents and older brother with Emma's sponsor/witnesses. Here's something for Confessional Lutheran Pastors to chew on. What is Sponsorship? Three decades ago and further back the sponsors would become the guardians of the child should his/her parent die. Not so any more. Parents need to have a will in place and the general knowledge of who the guardians of their children will be. Baptismal sponsorship plays no role in the court's decision on guardianship. 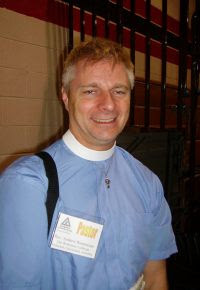 So, what kind of vows can a Confessional Lutheran Pastor legitimately ask the sponsors to take upon themselves without making the sponsors swear a false oath? 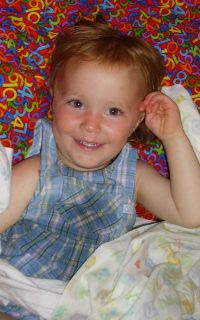 Mary and I have Char and Dave as the sponsors for all of our children and they are in our will as our children's guardians should we die. Our family knows this and accepts this. But sponsorship has become a way to honor friends and family members these days. At best, sponsors can serve as witnesses to the baptism and may be asked to encourage the child to persist in learning the Gospel of Christ. The problem is that we live in a pagan society, no matter how many polls show how religious the U.S.A. is. So, do sponsors have to be of the same confession of faith as the child? Well, if the sponsors are not Christians they can only serve as witnesses, they cannot be bound to raise the child in the Christian faith. So, yes, the sponsors should be Christians. Should the sponsors be Lutheran? Well, if the sponsors deny the means of grace (as do most of the protestant and reformed denominations) there is no sense in having them serve as anything more than witnesses to the baptism. Should the sponsors be of the exact same confession and fellowship as the baptized child? What are we asking the sponsors to do? Especially consider the vows that some ask of sponsors if the parents should die. Can any sponsor reasonably be expected to keep such a vow? Only if they are the legally appointed guardians as well. Some pastors have split families and congregations on fellowship issues with regard to baptismal sponsors and demanded oaths of sponsors that they cannot truly be expected to fulfill. Unless the sponsors are the legal guardians as designated in the parents' will, there is no need to treat sponsors as anything other than witnesses. And there is nothing other than sin to ask the sponsors to swear about ensuring the child is raised in the Lutheran Faith if the sponsors do not have the legal authority to do this. For the Confessional Lutheran Pastors out there, how many of the sponsors you have asked to swear such oaths before God and His Church are realistically able to perform their oaths? Sponsorship is not a teaching of Scripture, there is no need to split a congregation or family over it, nor is there a need to cause people to swear falsely. Treat baptismal sponsors as witnesses to the baptism unless you know for sure that those sponsors are the legal guardians of the child and have the ability to perform what the oaths demand of them. Saturday I held worship at Mt. Olive, Saturday School, and Confirmation Class. The afternoon was filled with a variety of tasks. I needed to complete the bulletin (Mt. Olive went without this week) and the July Calendar (again, Mt. Olive went without). Some might wonder why I labeled this post Bowyering. The answer is in this first photograph. This is of my flax bed. I'm growing flax to make a Flemmish bow string. A fortunate happenstance, at my dad's farm there was a windfall Ash tree. The trunk is almost 2 feet in diameter. It broke off at about 7 feet high. There is plenty of wood there for many bow staves, if only I can harvest it soon. I hope to go back down to their place in early July to cut the trunk and split the wood. In the evening when I went back to the office this little critter was standing on the concrete block at the entrance to my office. 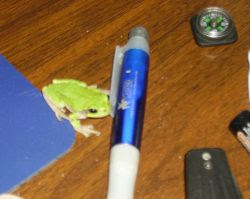 Some readers will be familiar with my frog entries from last year. This one looks like a different species from those I posted previously. Possibly this is a lean young Cope's gray treefrog, or a Gray treefrog. I don't know which. Thursday, after convention, my grandparents were at Mom and Dad's. One of the topics of conversation was frogs. They had claimed that there were no frogs found anywhere. Well, there are a whole lotta frogs where we live. You can hear them every night, at least three different species can be made out by their songs alone. But we live in a huge swamp. The other sound that one hears at dusk (which is quite late in the evening these days) is the high pitched hum of mosquitoes. 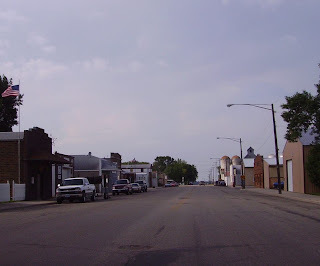 Here are couple of towns we passed through on the way home. Morton was on my way home from Mankato to mom and dads' place. It's not a really big town. 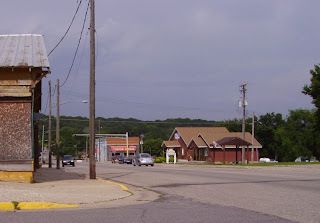 It's located on/by/in the Lower Sioux Reservation on the Minnesota River. My grandparents live there. I stopped by to see if they were home. They weren't. Which means they are probably at mom and dads'. 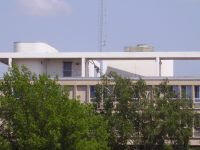 Wikipedia actually has an article on Morton. But Morton has its own website too. This is the main drag down Belview (which also has a wikipedia page as well as its own web page). The area where I grew up was ceded by the Lakota in the 1851 Treaty of Traverse des Sioux. It also became the battle ground during the Dakota War of 1862. The final battle, The Battle of Wood Lake, took place just 3 miles east of us-about a mile south of Gertrude Christianson's home place in Sioux Agency Twshp. Grandpa A (my dad's dad) found a musket barrel and some other junk when he was opening the land for farming in the 1940s. Col. Sibley's men probably marched through the area our home farm is located on. I took off for home early Friday morning with the boys. Only one photo from the trip for you. 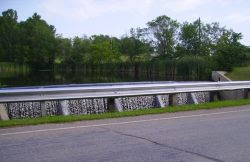 This is the dam at Swift Falls. The park is nice, that's where John had to stop on the way down. We went through Detroit Lakes up to Red Lake Falls, so I could fill out some paperwork for a marriage license at the RL Co Courthouse. A short stop at the Library there, and then home. My plants really needed watering when I got home. I'll have to transplant them outside soon. The tomato plants are pretty tall. The pepper plants are escaping their greenhouse. Only the cacti are still small. I'm not going to be posting on convention business in this blog. There were a number of positive and negative things that took place. But that will be the business of my congregations, not the general public. Matthew lost a tooth on Monday-a molar. He was particularly proud of it and put it in a Tic-Tac box for safe keeping. John liked being at Grandpa and Grandmas' place. "They have lots of really, really, really, neat stuff." 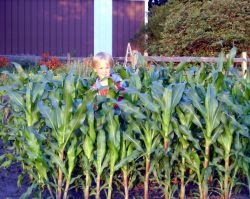 The corn in their garden is as tall as John. There really is a marked difference in growing season from Belview (273 miles south of) to Oklee. This week the moon, Saturn, and Venus were all aligned kind of close on the elliptic. Monday night the moon was between the planets. Wednesday night the moon was way to the east of the planets. 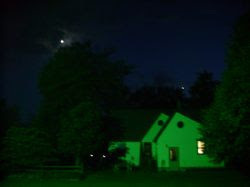 Here's a shot of the moon and Venus above my parent's house on Wednesday evening. Sorry it's kind of shaky, I didn't have a tripod. I sat down in my bath on Wed night and experienced a pain. I've used this tub off and on since 1972. It has never caused me this kind of pain. I reach down and search the water. What do you think I find? Matthew's tooth. As Sarge would say to Beetle Bailey "%&@#!!" Here are some photos of old friends from Madison, Wisconsin. I didn't ask them if they wanted their names here, so I'll leave the names out. 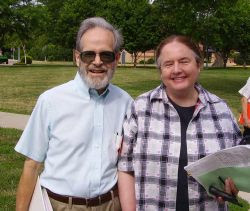 But we grew close to this couple while we lived in Madison and attended Grace Lutheran. We missed seeing the other couple from Grace who also usually come to the convention. Along with a lot of different greetings and such come the goof-ball pastors. In this shot we have Prs. Krikava and Jacobsen. Pr. Jacobsen is the one who looks more like Sean Connery. Krikava comes from the East Coast, Jacobsen from the West. Yah, I know that this entry lacks any real information. Whaddayawant? Anyway, Friday morning, we start off for home. Coming back home from the last service at Nazareth on Sunday I got a good photo of the kind of flooding that's been happening here. See the duck floating in the water. The water is 6 inches deep. 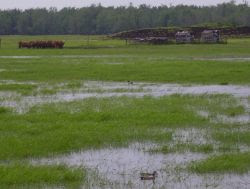 The water is in a cow pasture. The brown things in the back on the left are the cows in the pasture sunk up to their knees. Jeremy, Matthew, John and I got ready to take off to my parents' place down in Belview. After eating noon dinner I put Stella down for her nap and took a nice picture for the trip. Then, we were off to southern Minnesota. It was quite the eventful trip. It seems that Johnny's bladder can only take about 70 miles. As the whole trip is 273 miles you can calculate the stops. I got stung by a yellow jacket at Swift Falls when we stopped at the park there for John. So we got to Mom and Dad's around 9pm, I think. The plan is that Dad (retired) will put Jeremy and Matt to work with some fun jobs around the farm. John can play with all the different toys that he can find. Monday morning I head off to Belview so I can ride with Pr. Faugstad to Mankato. Belview to Mankato is only slightly longer than Oklee to Grand Forks. It's not a bad commute. The road certainly has more turns and curves. Monday of convention is 1 day late to get a good seat. Lot's of congregations skip church on this day, or have one of the elders read the sermon, so that the pastor and their delegates can get to convention. This guy is Pr. Burmeister. He's from Kallangur, Queensland, Australia. He wasn't born there. He's originally from Winona, MN. But now he's down in the skin cancer capitol of the world where slip-slop-slap is a health campaign, where wallaby's and 'roos are worse than deer, where the moon changes phase from left to right, and where water spins down the drain backwards. When Pr. Burmeister was in seminary he came up to our parish to help out a couple of times. It was good to have him here. We used to work together at Bethany with the InfoTech department. Now, instead of trying to explain Microsoft Outlook to someone, he's preaching the Gospel of Jesus Christ to people in a nation that has become a secular/agnostic state. I was up really too late this evening. It's 2:10 am by my watch. I just posted about Edwin. But I wanted to add a note. When I came over to my office after 11:30 Saturday evening I could still see sunlight on the horizon in the North Northwest. As I am ready to go to bed, now I see sunlight on the horizon in the North Northeast. Anyway, our house is 8 miles North and 4 miles East of Latitude: 47.84 N, Longitude: 95.85 W.
After worship at Mt. Olive, today, we would have had Saturday School and Confirmation Class. But, because of the funeral, we had to cancel classes for this day. So let me tell you about Edwin and Stella. Edwin and Stella are the kind of friends you want to have. They've raised the kind of family that you want to be part of. You know how parents love to hold and tickle their small children? Somehow, through the years, as the children age a distance forms between them. Propriety sets up some barriers and it's no longer acceptable to even hug each other, though the other is a brother, sister, mother, father, son, or daughter. From what I've seen of Edwin and Stella's children and grandchildren, they defy this convention. Not for the sake of defying it, but because they love each other. I buried Edwin today. Just last Sunday I was over to visit Edwin and Stella. I wrote about it then on this blog. My main concern that day was Stella. But Edwin, though he had lung problems, I took for granted that he would be there next week. It is strange how one can remember some events with such clarity and specificity. When I was visiting them last Sunday, Edwin's son, Gary, had gone through the yard on a tractor. Edwin was concerned that Gary might not know about a heifer that had recently calved. For those of you who have never handled or been near cattle, getting between a mother cow and her calf is a very dangerous situation. It can be dealt with in ways that do not cause harm, but whoever is between the cow and the calf needs to know how to behave. 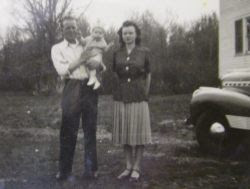 One of Edwin's main concerns since his brother Raymond passed away was the baptism of his own great grand daughter, Quin. Quin's baptism was scheduled for this Sunday. But because of Edwin's death, this wasn't to be. 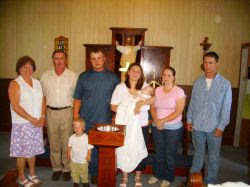 Instead, we had her baptism after Edwin's committal. Christians must be very careful about the sacraments God gave to us. We must never turn them into works that we do to please God in some way. It was a wonderful thing to experience. On the day we celebrated Edwin's entry into heaven, we also received God's promise that He will abide with Quin through her life. She is now baptized into Christ. She has inherited eternal life through the Son of God, Who was sacrificed in her place. Edwin is in heaven. Today we planted the seed, his body, in the ground. He will rise again because Christ himself has risen. Quin is now granted the same salvation through the means of baptism into Christ's life, death, and resurrection. With the whole family present, this was a wonderful way to celebrate Quin's baptism and Edwin's homecoming. May God grant that all Edwin's children, grandchildren, great-grandchildren and their spouses live in the faith that they have been redeemed by the blood of the Son of God. With regards to our own family: Mary kept the kids busy with cleaning. As a reward for good work done by all our kids, we went to Lengby's Spring Lake Park. Mary tried calling the Staffords, but they were gone. I like Spring Lake Park. There is a beach for swimming, a boat launch, and a fishing dock. In addition to this there are a couple of rain shelters for anyone who wants to eat there and several places to grill. We got home kind-of late. After getting the kids showered and in bed I still had several things to do in the office. This post is actually put up at 2 am on Sunday. I've back-dated it to Saturday to keep the continuity of the blog. 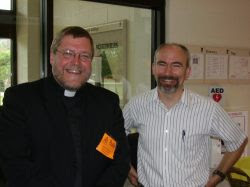 Sunday I go to our synod convention. Please keep our parish and our synod in your prayers. No one, and no thing should be taken for granted. Only God's grace to us in Jesus Christ is a sure thing. But that is only through the Word and Sacrament. Seek God where He says He may be found. And seek Him there only. I've often said that I'd rather have a funeral than a wedding. Why? Many pastors can relate to this situation. In the case of a funeral you know what you are dealing with and, if you have been diligent in your duties, you know what is the faith of the person you are burying. In general, the pastor has the confidence that the deceased is in heaven. A wedding is a beginning of more opportunity to sin in this world. And though we pray for God's preservation on a marriage, we all know the detestation that sin and Satan can wreak upon a marriage. But I don't say that any more. I've had too many funerals. Maggie B's mother, Patricia, died Sunday. She had terminal cancer, but even so, this was much sooner than was expected. Please keep Maggie, Lonny, and their family in you prayers. 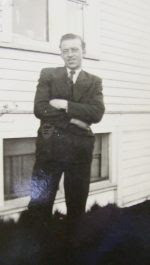 Edwin H. died this week. His funeral is Saturday morning. Please keep his wife, Stella, and their family in your prayers. This parish has had a lot of funerals this year. Each one takes a bite out of me because I know and love each of those whom I am burying. Corella, thank you for your email and your kind words. Corella emailed me because she also took note of the number of people I've had to bury in the past few months, including her mother. This might seem a bit disjointed in logic, but my wife, Mary, and I watched the PBS movie for Jane Eyre. In the story when Jane is a child at a deplorable private school, her best friend dies of TB. There is a scene where several pine box coffins are stacked up fur burial. Here is what I took to heart. I have not yet had to bury a child, nor have I had to bury many people because of plague or other disease. A part of me is torn for each of my members and their families when they lose a loved one, when I lose a friend. But God has yet spared me of such great tragedy as our forefathers had to bear regularly. I know Patricia's and Edwin's faith and where they are now. And that is the hope and goal of all who confess the name of Jesus Christ. While we walk in this, the valley of the shadow of death, we may fear no evil. For the Lord is with us. While Patricia and Edwin enjoy the mansions laid out for them; while we and their families mourn their loss; may God keep us all in the means of grace that we may inherit the our heavenly home when He calls us from this vale of tears. We do not mourn as those who have no hope. For we know what Christ has won for us--what belongs to us because of His life, death, and resurrection. May God strengthen this weak flesh of ours. Edwin's great grand daughter is to be baptized this Sunday. He had hoped to see this happen. He will see this happen, though he is not here now. And with that Baptism, his great grand daughter also inherits eternal life in the name of the same Savior of the world, Jesus Christ. Now it's time to embarrass my wife. I love Mary. She is more than I could ever desire or ask from God. The 13th was her Nth birthday. She has no gray hair. But that would make no difference. Louisa coordinated a cake-making for her birthday. When we celebrated I limited the number of candles to be lit. She has borne 8 children, and we have one on the way, due in mid to late July. She is the most loving, patient, kind, wise, faithful, and fun friend a person could ever hope to have. So we went to the grocery store on her birthday. Now, this isn't my idea of a wonderful present for my wife, it just happened that we needed some groceries. So just Mary and I went. And she happened to pick out some kind of energy drink that had a funny name. She didn't think of this when she picked it out. But in the check-out lane, where we happened to be behind the parish secretary and her son, I noticed the name on the energy drink. It's here in the photo. So I took advantage of the name of the drink and told the parish secretary that the reason Mary and I were in the grocery store on Mary's birthday was to get (insert the name of the drink). She's going to kill me when she sees that I actually posted this. It rained the last day of VBS. It was Wednesday morning, I got a phone call from Gary H. that his father, Edwin had passed away. I had just visited Edwin and his wife, Stella, on Sunday. Edwin's passing was sudden and unexpected for me. He had had heart problems through the years. But still, there is a great deal of shock that one must deal with. Playing outside at VBS on Wednesday was a bit, well, wet. And as it was the last day of VBS it was also clean-up day. Chloe and all the kids did a great job in cleaning up. The Oak Park Ladies' Aid will do a general church cleaning after VBS as part of their annual church cleaning. But thanks to the teachers, craft leader, and the kids, the impact of VBS will be minimal on their clean-up. Actually, the kids thought that the zoom-brooms were fun to use. Chloe, Zach, Josh and several others begged to use the zoom-brooms. Regular readers of this blog will remember Josh. He's the one who froze his tongue on the bell tower. Well, he's smiling now as he cleans up the debris of VBS. They went from the Altar to the back of the dining hall sweeping up what was left over. Kids were outside in the rain picking up the small scraps of evidence that they had eaten their lunches outside. Tylor, Whitney, Shane, Dawn and others worked to pack up the Nativity sets so that the kids could work on them next year. The Nativity set is an ongoing project from year to year. Each year the student gets a few more pieces to paint and build their set. Now, VBS is done for 2007. It was a wonderful experience for me as a teacher. Yes, we had a few cuts and bruises from play. Yes, Logan lost a tooth: thankfully it was one that was ready to come out. And the kids got experience in learning the Hymns of Lutheranism so that they can sing them with gusto when they come about in the Church Year. The VBS kids can sing these in the native tongue of the Old Testament. And they know what the words mean. Christ the life of all the living. Christ the death of death, our foe. Praise the Lord. 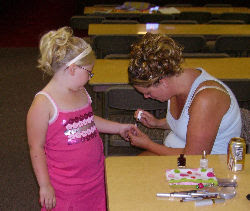 The point of crafts at Vacation Bible School is to reinforce the lessons in the memory of the children who attend. Some of these crafts are transient in nature. Trisha (who was confirmed this year) is in this first photo with kids making cookies in the shape of the cross. Part of the reason for cookies is teaching kids through all senses. We all remember good smells and tastes. Permit me an anecdote from a TV show. Remember MASH when Hawkeye was determined to discover what death was? Toward the end of the episode he spoke to a soldier who was just about to die. The soldier said he smelt bread baking and thought of his home and mother. Hawkeye was left in the dark. But the point I want to emphasize is that memory and learning is not just about letters and words, but also about the other senses as well. God gave us Baptism and the Lord's Supper as means of grace. These means of grace are not merely the Word of God, but the Word of God applied to our senses. Taking the lesson from how God gives Himself to us we also take advantage of all the senses to reinforce memory of the lessons taught through God's Word. Other crafts are of more enduring nature. Here the mid-level students are making crosses with wound string. A craft that they can take home, hang on their wall, and enjoy for the rest of their lives as an actual work of art and beauty. And with that enjoyment comes the remembrance of what was taught them through God's Word about the life, death, and resurrection of their Savior. There are some drawbacks to crafts and planning for them. 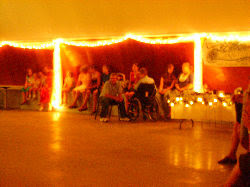 The Cross of Christ was central to the theme of this VBS. Alison came up with the idea of having the kids make pillows with fleece and stuffing. It ended up being a great deal of work for her and several others. There was a kit for the same kind of project at a vendor. The lesson learned, sometimes it is more efficient to get the kit than to go on one's own. But Alison is a wonderful person who was able to see the project through to a wonderful end result. My daughter, Clara, took the pillow she had made at VBS to bed with her tonight. And fell asleep on it smiling. Thank you, Alison. This is Nitro C's Nativity set. When the kids are at a certain age and level of ability we have them begin to paint their own Nativity sets which they can use for the rest of their lives to remember the Gift of God the Father who gave is Only Begotten Son for our Salvation. I put this photo as an example of the quality of workmanship that Dawn elicits from the students. The second reason for putting this particular photo is and example of what a student can produce of lasting value. Nitro suffers from a form of autism that allows him to keep many, many topics in his mind at the same time, but prevents him from focusing on a particular topic for an extended time. Even with this gift and curse, Dawn was able to help him produce a work of art that he can use for years to come. Here is Dawn putting the fixative on a finished Nativity set. Dawn, Ione, Alison, Trisha, and everyone else who helped so much with VBS, thank you for making this year a great year with the crafts and lessons. I know the kids enjoyed VBS. And from the questions I asked them all during the daily devotions, I know that they learned well from you all.